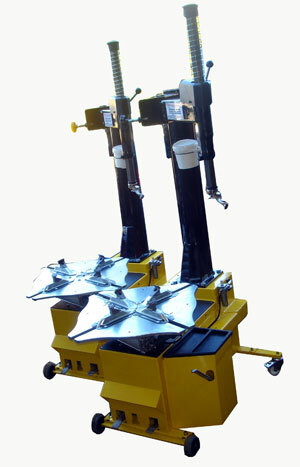 The SMaxi GT is Giuliano's Semi-automatic tyre changer with sideward's moving arm, expressly designed for oversize and racing tyre's. It is suitable for car and motorcycle wheels having rim size from 10" to 22" (max. diameter 1200mm/47,5", max. wheel width 390 mm/15"). The SMaxi can be fitted with a range of accessories including the interchangeable mounting head system detailed below. We have also made several 'special' Smaxi RACING machines. They have proven very popular in motorsport due to their ruggedness, simplicity of use and specially lowered table. Avon Motorsport and Dunlop Motorsport both have several of these unique machines. The machines above left were made for Dunlop Motorsport and are currently in use on the LMS service, the machines on the right were for the [ALMS service in America]. 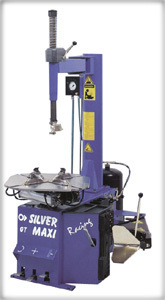 Contact us for more information if you think one of these special machines would suit your requirements. Our specially modified Giuliano Maxi GT Racing in use at Dubai 24hr. Lowered machines fitted with twin speed motors. Over 80 cars, during the race each car will pit between 18 and 19 times, each pit stop requires four tyres, meaning each car needs at least 72 tyres apiece. All tyre equipment supplied by Racingage.